Looking for things to do in Cabo? You’ve come to the right place. Cabo San Lucas and the surrounding areas are full of fun things to do for all ages and the abundance of tours to nearby attractions create the recipe for an incredible vacation. The unique combination of desert terrain, mountains and beautiful beaches make for many exciting activities and attractions for every type of visitor. Fishing and golf are two top Cabo San Lucas attractions, but Cabo is also well known for its restaurants and top rated spas. Whether your preference is a leisurely Cabo vacation strolling through Cabo’s shopping malls and lounging on the beach, or a more exciting one filled with zip line tours over the desert and ATV rides, you’ll be sure to have a good time. There truly is a Cabo for everyone! Scroll down to see all the things to do in Cabo! Wondering “What is there to do in Cabo San Lucas?” Here is some basic information and some tips on what to see and what to do in Cabo San Lucas and the nearby area. Be safe and have a great vacation in paradise. If you have any questions about activities in Cabo, please contact us at (281) 410-5660 or fill out our contact form. It’s Fall in Los Cabos! Just before high season, you get great weather and good deals. Fall in Cabo is a great time for golfing, fishing and more! From whale watching tours to eco-friendy trips to Espirtu Santo, Cabo Expeditions is Cabo’s premier eco-adventure and tour company. From great beaches and stunning rock formations to top party spots, these things to see in Cabo San Lucas will leave you wanting more. Be sure to spend a day at the beach, take a cruise and spend an evening out on the town enjoying the famous Cabo nightlife. The smoothest ride in Cabo! Listen to today’s contemporary Jazz music as you enjoy an international bar, serving premium wines and hors d’oeuvres.. Bringing the kids? There are plenty of kid friendly things to do in Cabo. From fabulous beaches to cute dolphins, your kids will have an amazing time. Be sure to double check the ages on any tours before booking. One of the most reputable sportfishing companies in Cabo, Pisces Sportfishing offers 20 years of experience in Cabo San Lucas chartering. They also promote the conservation of billfish – Fish’em and Release’em. The best of both worlds! Championship golf and record breaking deep sea fishing are two of the best activities in Cabo. Los Cabos offers some of the best marlin fishing in the world and some of the best golf courses in Latin America! Looking to hook that big marlin? Juanita’s Sportfishing features everything from all inclusive fishing charters to fish mounting. Pueblo Bonito Resorts feature a number of award winning spas in Cabo San Lucas. From couples massages to authentic temazcal experiences, you’ll be sure to enjoy. In the mood for some therapy? Whether it’s the massage or retail kind, there are plenty of places in Cabo. Cabo San Lucas stores and shops have plenty of familiar products as well as many unique gifts for you to bring home to friends and family. Sea Spa & Salon is located at the Cabo Surf Hotel. This cozy spa offers pedicure, manicures, massages, bridal treatments and more. Cabo’s Original Party Cruise! Snorkeling, Sailing, Booze Cruise, Whale Watching Tours include an open national bar. The number one thing to do in Cabo is to get out on the water. From family friendly snorkeling and sightseeing cruises to full on party boats and everything in between you’ll be sure to find the right way to enjoy the Los Cabos coast. 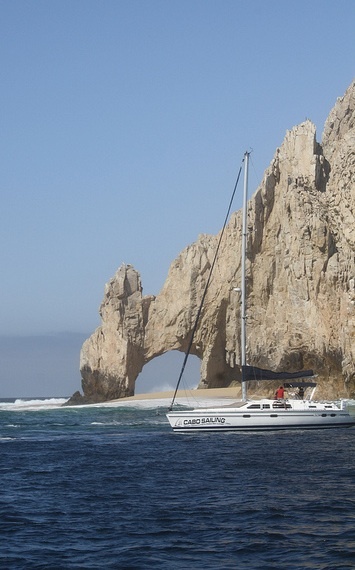 With a collection of luxury sailing yachts in Cabo San Lucas, Cabo Sailing offers custom private & shared sailing cruises and traditional tours such as snorkeling and romantic sunset sailing cruises. Like to spend your time in or on the water? Scuba diving, swimming, surfing, parasailing, snorkeling, SUP, wind surfing; you name it and it is available. Cabo San Lucas water sports offer you a chance to enjoy one of the best things about Cabo – the Sea of Cortez! Located on the premises of the Cabo Surf Hotel, the Mike Doyle Surf School has large rental fleet of Surftech boards including long boards, short boards, soft boards, boogie boards and Stand Up Paddleboards. The surf school offers private and group lessons. Sunset Cruises, Sightseeing and Whale Watching Cruises. Design Your Own Cruise with personalized service. There are plenty of adrenaline pumping activities in Cabo San Lucas. From zip lining over the desert to flying over the Sea of Cortez with a friend on a parasailing adventure, you’ll be sure to find your thrill fix in Los Cabos. Nearby towns and cities that make for the perfect day trip from Cabo. Within 3 hours you can visit everything from a desert oasis and to a popular surfer colony. There are often tours to these spots or you can rent a car. We hope that you enjoy your trip to Los Cabos. Be sure to check out our Cabo Forum or our Cabo blog for more tips and ideas of what to do in Cabo San Lucas. If you have any questions, please don’t hesitate to contact us. You can also sign up for our newsletter to get the latest news and deals on Cabo activities.